Constructed in 1887, the majestic Eldridge Street Synagogue has been a staple institution in the Lower East Side for 130 years. Any New York City landmark that has been around for over a century is bound to be filled with plenty of secrets. 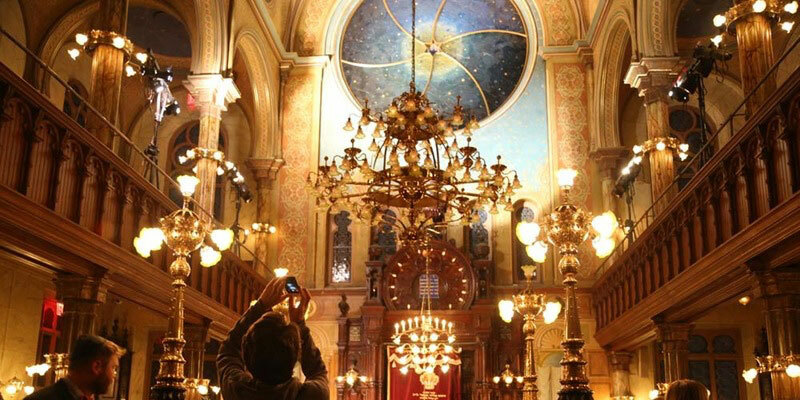 For example, did you know that the cluster fixtures of the Synagogue’s chandelier are actually upside down? And that no one knows what the original eastern stained glass rose window looked like? In celebration of the Synagogue’s 130th birthday this fall, join us on our Secrets of the Synagogue after-hours tour of the building held in partnership with Untapped Cities. Learn about the history of our beloved National Historic Landmark, see its stunning architecture and discover its hidden gems after it’s closed to the public. Take part in a beer, wine and nosh reception, featuring knishes from Yonah Schimmels, pickles from the Pickle Guys and baked goods, including rugelach and black and white cookies. Beer is generously donated by Brooklyn Brewery.